Maggie Dempsey is tired of attempting to become part of the "in" crowd every time her parents decide to move, which is every year. Maggie has had ENOUGH. She's managed to become one of the popular teens at every school she's been. It just hurts too much now to make and lose the same friends within months. So...what is a girl to do when she doesn't want to make friends? 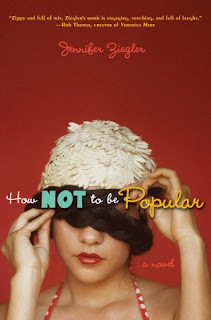 In How Not to Be Popular by Jennifer Ziegler, Maggie Dempsey tries her hardest to become the least popular student in the entire school. Choosing the ugliest clothes, talking about the oddest stuff are only a few ways Ms Ziegler keeps her readers laughing. Maggie will do her best to avoid making any friends in every possible way. ...And as Maggie attempts what seems to be so easy, she may yet discover the truth about how popularity really works. How Not to Be Popular will keep you laughing all the way through.